I am impulsive. I always have been. Back when I was much younger though, my impulsivity sometimes got me into trouble. I acted, far too often, without thinking. Now though, I feel in many ways, that my impulsivity serves me well. 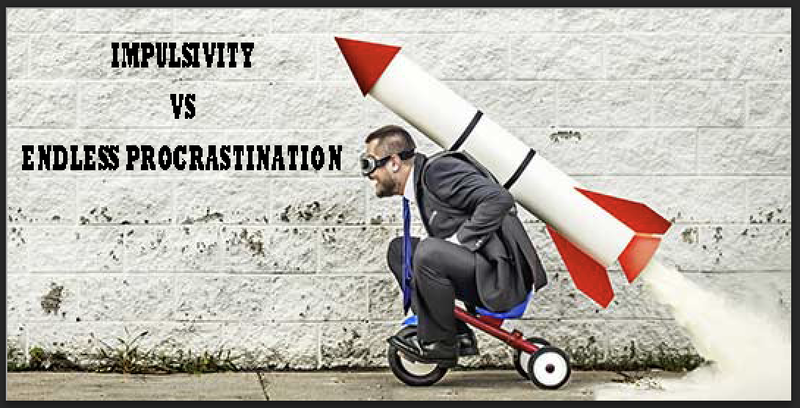 Impulsivity, is perhaps the counterpoint to over-procrastination. We have, in my view, perhaps too much choice available to us - in many areas of our lives. Too many breakfast cereals, too many houses to choose from, to many superannuation funds to invest in, too many health-care providers, cars, sound systems, etc. Having to decide between so many options - often leads us to be paralysed - and ironically, we can ending up choosing nothing. Too much choice also offers up much more opportunity for regret afterward - did we doin the right thing; would that other car have been better? Etc. With more choice we also personally, become more personally responsible for our level of satisfaction/happiness. So, what I once called ‘impulsivity’ - I now call ‘pulling the trigger’. I choose - I do it quickly. I live happily with the result. Just saying!